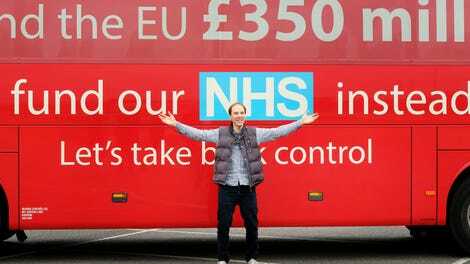 The Brexit campaign is the closest analogy England has for what America went through when Donald Trump was elected president. The country’s historic referendum, in which its citizens voted to leave the European Union, was the kind of shocking, “Wait, what did we just do?” upset of politics-as-usual that saw even seasoned political vets gaping at the outcome. 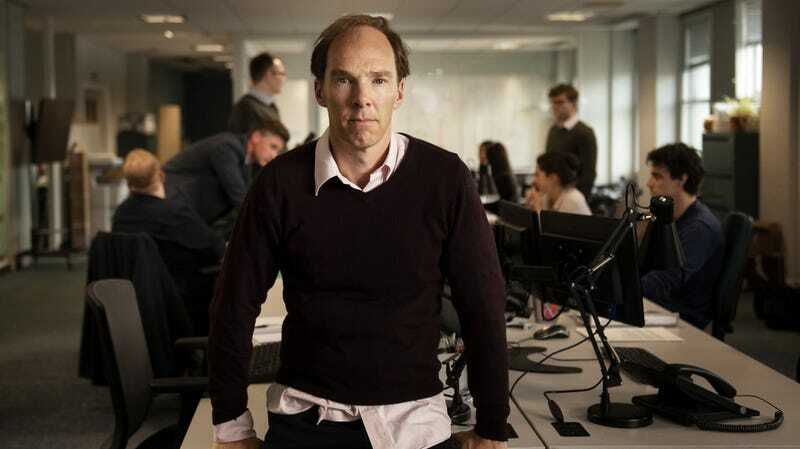 And Brexit, the new HBO film starring Benedict Cumberbatch in a balding hairpiece, works overtime to remind the viewer that, hey, this is a bad thing, okay? Bearing a terrific cast and clever screenplay that occasionally pops with a fizzy, Sorkin-lite flair, the movie nonetheless goes all-in on some blunt-force symbolism and cheesy imagery that renders things overly simplistic, sapping subtlety and delivering the tale of England’s ill-considered destabilization of its global position with the moralizing of an after-school special. (In other words, the worst of Sorkin’s political storytelling instincts are adopted by the project, right alongside his better stylistic tics.) This is the kind of film in which the climactic moment of defeat for the forces of stability, depicted in a blue-hued room of stunned campaigners watching as their efforts to keep their country in a sensible international alliance, feels the need to cut to a shot of air literally going out of a balloon. “Get it?” the scene asks. Don’t worry, Brexit will make sure you do. The film tracks the people behind the Brexit movement from the moment David Cameron announced the referendum to the surprising results, with a focus on Dominic Cummings (Benedict Cumberbatch), the primary architect of the winning campaign strategy and the person responsible for bringing in AggregateIQ, the technology company that utilized state-of-the-art microtargeting to reach people online through data harvesting and almost certainly transformed the outcome of the vote. (A brief shot of Steve Bannon makes the Cambridge Analytica connection perfectly clear, but in case anyone missed it, end cards are there to remind you this was all funded and executed by the same parties responsible for Trump’s victory.) It can be a bit perfunctory in the early going, as Cummings butts heads with establishment politicians on the right and fends off efforts by the blatantly racist “leave EU” radicals (embodied in Paul Ryan’s preening Nigel Farage), but picks up steam once it finds Cummings’ true nemesis in Craig Oliver (the reliably great Rory Kinnear), director of communications for Cameron and the blue-blood traditionalist struggling to preserve EU membership in the face of Cummings’ insurgency. At this point, Benedict Cumberbatch can probably play “arrogant but tormented visionary” in his sleep. From Sherlock Holmes to Alan Turing to Stephen Strange, he’s cornered the market on ferociously intelligent men continually let down by the minds around them, and he plays Cummings as a kind of frustrated wunderkind, a man convinced he could fix everything if someone would just hand him the damn keys to the shop and let him do his thing. Like the aging version of Jesse Eisenberg’s Mark Zuckerberg in The Social Network, his strategist is shown as perpetually exasperated by the inability of others to keep up with him, and while there are small moments added to humanize him (his pregnant wife, his continuous healthy behaviors), he’s still a man who lives for the intellectual battle of the campaign. Though the obvious parallel on this side of the pond would be Steve Bannon, Cummings is far too British (read: less of a messianic thug) for any one-to-one correlation. It’s a great portrayal, and pulls in the viewer with his self-confident magnetism even when the direction goes over the top. This well-intentioned liberal history lesson is too pandering, turning its main villains Farage and Arron Banks into cartoons (again, the counterargument: They kind of are?) rather than people. But Graham’s script captures the nuances of Britain’s roiling identity crisis with deft insight, and the whole thing is packaged in such an enjoyably crowd-pleasing way that its flaws linger without dragging the proceedings down. It’s reductive and ham-fisted in its direction, sure, but still makes for a breezily engaging tale—like a good episode of The West Wing that just so happens to shine a light on one of the most controversial political upheavals in contemporary British history.